The leaves on my passion flower were doing great then starting going yellow and falling off. I repotted with better soil but it has got worse, hardly any leaves. If I cut back, will it come back? There are a number of reasons why your passion flower leaves are turning yellow such as over/under-watering, insect pests, chlorosis, root issues or nutrient deficiencies, and lack of sunlight. Each of these issues are discussed in turn in the article below. 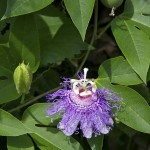 Cutting your passion flower back will not resolve the underlying issue. My recommendation is to review the article below and see if anything resonates with your situation and take measures to correct it.